Sweet and Sarcastic: Bouquet Me! I’m not going to lie to you—I had a pretty great time on Sunday night making jokes about this moment in American History. Between Osama’s death and the Royal Wedding—well some might say I was out of control—but I wouldn’t trade a minute of it. I had an interview yesterday (hence all the Halo research). The first thing the guy said to me: I don’t even care if you know who Master Chief is. Me: Then I guess I wasted a lot of time reading that Halo Bible this weekend huh? Becky: I keep meaning to tell people my directions to my church, I love them! It's like you're going to MacnJacks, but instead of turning into MacnJacks, turn right. I love when I go to church. It's like every Sunday I have to choose a direction: Beer or Church. Becky had her birthday party on Friday. Jen was making her cake, and when she was looking for ideas, she asked me what Becky likes and I, of course, told her that Becky loves Jesus and she loves kittens. The result? When we got home from Becky’s party, Dawne and I were discussing the events. Dawne: You know I just don’t think we hang out with “Normal” people very often so we don’t even know what’s ridiculous and what’s not. I mean, even you have to point out when I’m being ridiculous sometimes. Me: And you know when I’m pointing out it must be pretty obvious. Dawne: That’s why we want to do it! Dawne: You really need to marry Prince Harry so I can get to go to a Royal Wedding. Me: Oh! I didn’t know you wanted me to marry him! I’ll get right on that. Dawne: Well he is the partier of the two… much more suited for you. Becky on Kate's bouquet: It's really small. Jared: That's just her car bouquet. She has another once she gets out of the car. Someone has a bandolier of bouquets, and she'll shout, "I'm out! Bouquet me!" Kevin: I can’t go to sleep—I’m teaching myself the multiples! Mo: Anyone can do tens, try 5’s. Me to guy getting on elevator: That was to her not to get off at 15, you can come on the elevator. It’s okay. Becky: You said that like I say no to the cats. Me (to guy as we’re getting off elevator): Have a great day… without us. Me: See, this is where we differ. 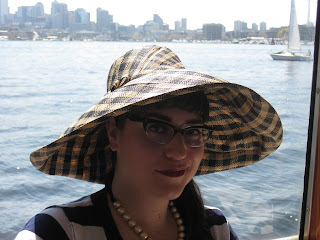 I went on a brunch cruise with Shana and her parents on Sunday. She texted me at 9:30: I am wearing a fabulous Cruise outfit complete with hat! We have to be there at 10:30. Me: Then I better get up then. Me: Shana is wearing a cruise hat. That’s so not fair. I don’t have a cruise hat! Dawne: I have a cruise hat. Older Gentleman: Can I take a picture of you ladies and your hats? See… some people do appreciate us! Caffé Ladro Shanniquah (okay fine, her name is Shannon, but I like to spice things up. ): I was roller blade-ing the other day and I hurt myself flailing my arms about. Me: Why aren’t we best friends? my cube mate Chris: "I want to steal her. If I have a kid, I hope she's french.